Thailand's King Bhumibol Adulyadej has called for national unity during colourful celebrations in the capital to mark his 60 years on the throne. The king, who is the world's longest-serving monarch, addressed a cheering crowd of hundreds of thousands of people in Bangkok's Royal Plaza. 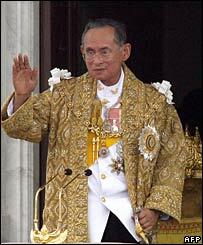 Speaking from the palace balcony, King Bhumibol, 78, said that unity would bring prosperity to Thailand. Dignitaries from around the world are in Bangkok for the celebrations. "Unity is a basis for all Thais to help preserve and bring prosperity to the country in the long run," the king told the crowd, which stretched some 3 km (2 miles). "If Thais uphold these ethics, it will ensure that Thailand will stand firmly," he said. Hundreds of thousands of Thai's, most wearing yellow or carrying yellow flags to honour the monarch, had gathered to hear the king speak. They received his address with shouts of "Long Live His Majesty!" "Police estimate almost one million people were there at the peak of the royal audience," Bangkok police spokesman Colonel Pinit Maneerut told the AFP news agency. "It's an unprecedented and historic event," he said. Many people had arrived in the early hours to find a place from which to see the king, who is both highly revered and very popular. Chom Taenglek, who arrived at dawn, wore a yellow shirt. "This is a very auspicious opportunity," he told Reuters news agency. "I would like to see all Thais sacrifice and do good for the country and our king, whom everyone should follow as a role model," he said. The open displays of affection for the king are genuine, says the BBC's Jonathan Head. Few Thais have anything but praise for the man they describe as being the very soul of their country. People all over the country have been wearing shirts to celebrate this special event, flags have been placed all over the streets around the country. King Bhumibol ascended the throne in 1946, after the mysterious death of his older brother. He has reigned - holding few defined powers of his own - through 17 military coups, 20 different prime ministers, and 15 constitutions. His relentless travel throughout Thailand earlier in his reign and his strong personal interest in rural development increased his public profile and won him lasting admiration. But it has been his timely interventions at moments of crisis that have earned him the gratitude of so many Thais - most recently when he ended the stand-off over a disputed general election in April, our correspondent says. The five days of celebrations will include fireworks, feasts and a river parade of ceremonial boats. Heads of state and senior dignitaries from around the world, including Japan's Emperor Akihito, Queen Beatrix of The Netherlands and the UK's Prince Andrew, are due to participate in the festivities.